Too much work, too many tasks, too many things to keep in check. Obligations, deadlines, stressors, and drama, albeit some imagined and others real. Sound familiar? Yep, a day at the beach is a good way to let it all go. I feel better already. Now the reality of getting out the freakin’ door, much less slamming it, is upon me. Medication or Bandaids to cover the angry, raw exzema outbreak on my daughter leg before it hits the bacteria-laden waters of Lake Michigan? Will the peanut butter sandwiches get smashed in the flimsy lunch bag once it gets jammed into the wire bike basket for the couple-mile bike ride to the beach in the heat? And of course, the age-old good cop/bad mom debate of whether I can justify REALLY letting it go and finding room for the sole cider beer that’s been chillin’ in the fridge for the past few days as a companion for the PB&J and butterscotch cookies. Realizing I’m just making things harder than they need to be by even giving the Woodchuck tagalong a second thought in regards to propriety, my 5-year-old and I hit it into the sunshine. The fact that an hour and a half has escaped between idea conception and clicking on the bike helmets is neither here nor there. But when the toe jam from the flip flop I’m wearing separates from the shoe’s base, causing me to lose my balance when I hopped down from my bike at a Lake Shore Drive Intersection, and roll my bike, as well as the attached ½ bike where my daughter was perched, proud as a peacock, was another story. Dammit! Is my daughter OK? Check. Did we fall into the street? Nope. The bike’s still in tact, but the day school field-trippers on the lakefront sure got their laugh for the day. Back on the bike, pedaling the last few blocks to the sandy getaway, my almost-kindergartener tells me she was embarrassed when we fell. Finally, we see the beckoning baby blue sky meeting the deep azul of the very active lakefront, and troubles are forgotten. Get. There. Now. Happy as a clam, plopped in the middle of a striped beach towel, shielding the sandwiches in our hands from the grit of the sand being blown by the wind, I’m confronted with the obvious. I hadn’t thought of that today, on the first beach trip of the season, with the thermometer barely hitting 80 degrees and the extreme warnings from friends (and meteorologists) ringing in my ears about the cold water temps this year due to the extreme winter be just crawled out of, and how we won’t be able to enjoy the summer. I looked at the goose bumps on my arms and then back at my daughter’s beaming face. Begrudgingly, I walk to the edge of shore and dip one toe into the surf. Death-defyingly frigid. 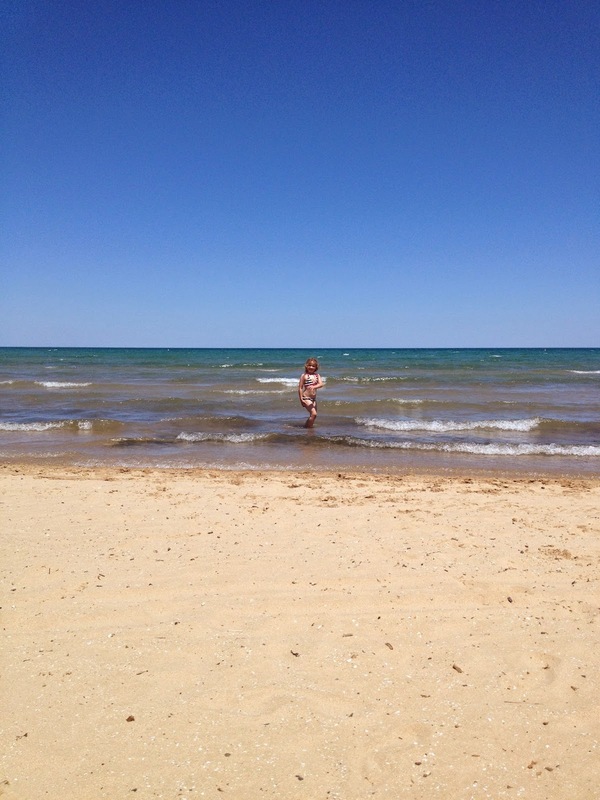 Then my child ran at full force into the lake, jumping over every wave and splashing me high and low along the way. Oh for the love of Pete. After an hour in the sun and surf, the water actually felt warm. We played, we paddle-balled, we wave-jumped, and we swam with full-body submersion for almost 2 hours. It was by far, the best day ever.